Heat gas or charcoal grill. Brush both sides of chicken with about 1/4 cup of the raspberry chipotle sauce. Place chicken on grill over medium heat. Cover grill; cook 10 to 15 minutes. Turn chicken; brush with 1/4 cup of the raspberry chipotle sauce. Cover grill; cook 3 to 5 minutes longer or until juice of chicken is clear when center of thickest part is cut (170°F). Arrange salad greens on 4 serving plates; top with raspberries. 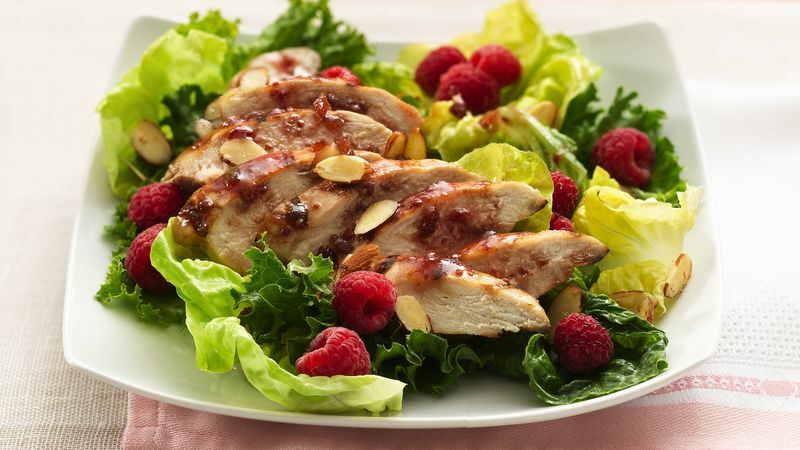 Cut each chicken breast into slices; fan over salad greens and raspberries. Garnish with almonds. In small bowl, beat remaining 1/2 cup raspberry chipotle sauce, the oil and orange juice with wire whisk until blended. Drizzle over salads. Look for raspberry chipotle sauce near the barbecue sauces in the supermarket. Glazed almonds can be found in the produce section. Serve this hearty salad with a slice of crusty bread and a glass of iced tea.